I met Chelsea Pensioner Walter Wildgoose in 1977 when he was 87 and I was 26. Through a series of letters written over the last year of his life, he passed along his life story - the workhouse children's home, a life in the British Army witnessing the opening battles of World War I and life in India, a remarkable family surviving the bombs of World War II London. This blog will document my research and progress on the novel I'm writing about this amazing man. When Walter joined the 2nd Lincolnshires in March 1908, he was stationed in Aldershot until February, 1911. We sailed from Southampton in a troopship called the Plassy, and it took two weeks by sea. Aden! What a place, the last place God ever made, a barren lot of hilly rocks and sand, no grass to be seen. (It is now know as the Yemen since the British handed over the protectorate to the Yemini Arab Republic.) We passed our time hill-climbing, fishing, beach-combing, as we had the sea quite close to us. It was a very hot place, and very cold at night. We spent a part of our tour of duty in Crater, so named as the barracks and the cantonment[?] was situated in a huge bowl, caused by the surrounding hills, and naturally radiated the heat out from the rocks. We would then be relieved by a detachment and then we would go to Steamer Point. During 1911, our King George V and Queen Mary came out from England to visit India to attend the Delhi Durbar. They arrived in Steamer Point in a P.O. liner called the Medina, which was all painted white for the occasion. A naval cutter left the harbour to bring the Royal pair ashore. We found a guard of “honour” on the landing stage. Our regiment, the 1st Lincolnshire Regt, lined the dusty streets. We all wore white duck suites and white helmets. The King spent a few hours at the residency before proceeding on his way to India. Each member of the regiment was granted two weeks extra pay as a compliment – equal to £1, quite a lot of money those days. We stayed in Aden until 1912 November, when we were relieved and we returned to our old barracks in Portsmouth. The usual military training took place during 1913, and then again in 1914. And we know what happened in 1914 . . . Does anyone know a good resource for the 1911 Delhi Durbar? I'm having a hard time finding reliable sources. I'd love to find something specific to the stop in Aden, but nothing's surfaced so far. I know a film was made of the King and Queen's trip (quite a famous film, where film history is concerned, I think), but I haven't seen many stills. If someone could point me to a solid reference on the Durbar, it would be much appreciated. I'd love to see some of those pictures. I could find only a couple through my online research. I do know that the entire event was filmed but haven't seen any clips from the movie, either. 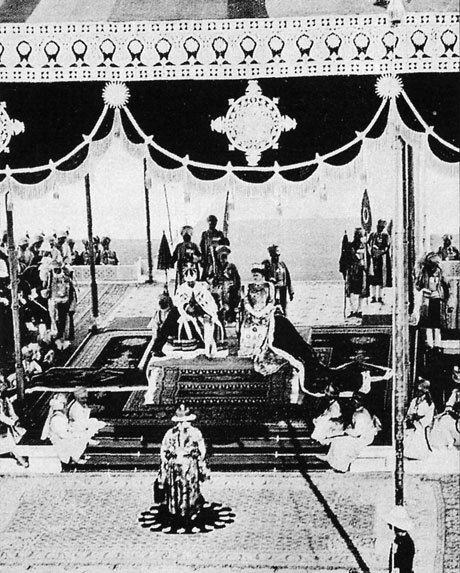 I am currently researching into the Delhi Durbar and the building of the new capital. Would love to see photographs and other supporting details on the subject, and of course detials of the said film. The National College of Arts Archives has administrative record on the making of Ampitheatre, Royal Dias and the Shaminas of the Dehli Darbar. Anybody interested can contact me for more information.